That’s great for your budget, conversion rates, and return on investment. You only pay to reach the most valuable potential customers. But it’s important to understand the different ad types and targeting options before you dive in if you want to get the best results. In this complete guide to Facebook advertising, we’ll walk you through everything you need to know about Facebook ads, from planning your first ad to developing advanced Facebook ad campaign strategies. These simple ads are great way to get started with Facebook advertising. You can create one with just a few clicks by boosting an existing post with a photo from your Facebook Page. Photo ads may be simple, but that doesn’t mean they have to be boring. 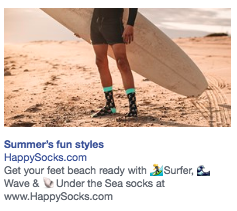 For example, you might think socks are a pretty ho-hum product, but Happy Socks puts them in surprising contexts to create fun Facebook photo ads. Video ads can show your team or your product in action, or they can simply be aspirational. 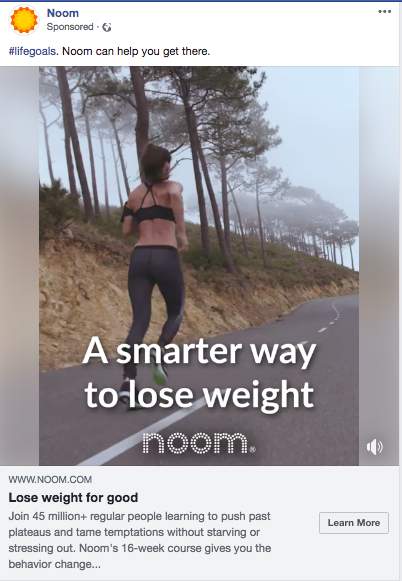 The video in this ad from Noom says nothing specific about the service itself, but provides clear motivation to learn more. The IT company Paessler AG used carousel ads to promote its free card game: The Game Against Downtime. Each pane in the carousel ad showed one card from the game, which is modeled after Cards Against Humanity but with an IT theme. The result was a 51 percent lower cost per lead compared to ad campaigns they had run in the past. Slideshow Facebook ads offer an easy way to create short video ads from a collection of still photos or existing video clips. They have eye-catching motion, just like videos, but use much less bandwidth, so they load well even for people on slow internet connections. You can also add text and music. If you don’t have photos of your own, you can choose stock photos from Facebook’s collection. These ads, which are offered only for mobile devices, allow you to showcase one or more products that customers can click to buy. 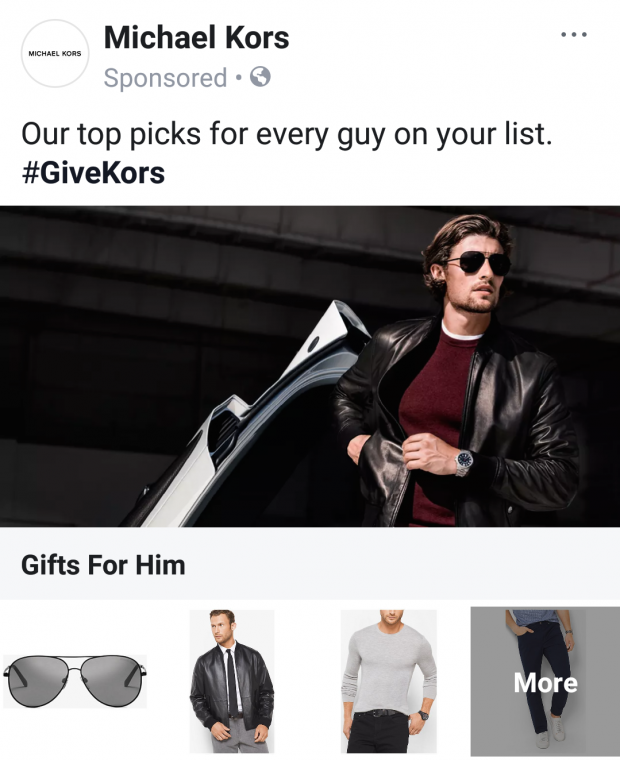 Collection ads pair with Instant Experiences (more on those below) to allow people to buy your products without ever leaving Facebook. This makes online shopping easy when people are on-the-go and may not have a great internet connection. Instant Experience ads used to be called Canvas. They’re a full-screen ad format that loads 15 times faster than a mobile website outside of Facebook, like this example from Cirque du Soleil. If you’re using the Facebook Pixel on your website (and you should be), it’s automatically added to your Instant Experience ads to allow full tracking. Lead ads are only available for mobile devices because they’re specifically designed to make it easy for people to give you their contact information without a lot of typing. They’re great for collecting newsletter subscriptions, signing someone up for a trial of your product, or otherwise allowing people to ask for more information from you. Philosophy used lead ads to promote product samples in the UK, generating more than 9,000 leads. 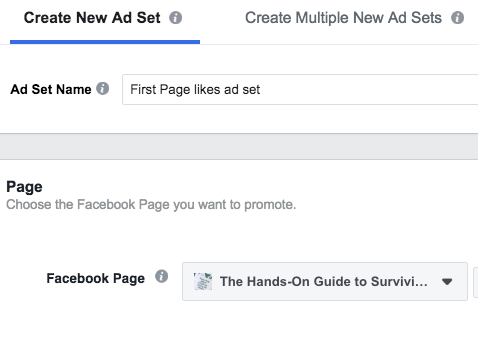 Because these ads are such a great way to feed your sales funnel, we’ve got a whole guide to using Facebook lead ads that breaks down all the details you need to know to make the most of this important type of Facebook ad campaign. Dynamic ads allow you to promote targeted products to the customers who are most likely to be interested in them. For instance, if someone has visited a product page or placed a product in their shopping cart on your website, but then abandoned the purchase, dynamic ads for that precise product will appear in their Facebook feed. This reminds the potential customer to complete the purchase, and can be a very effective Facebook marketing strategy. 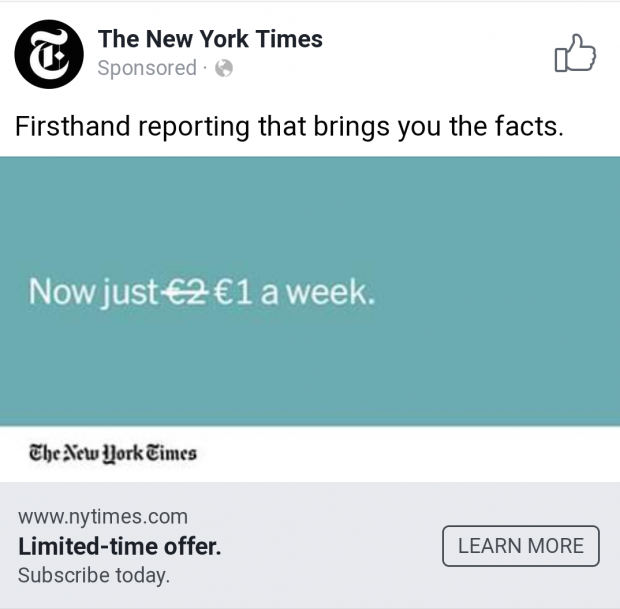 For example, after I hit my maximum number of free New York Times articles this month, I started seeing ads with a subscription offer in my Facebook news feed. Photo ads, video ads, carousel ads, and dynamic ads can all be set to appear in Facebook Messenger. This extra placement gives you access to the 1.3 billion people who use Messenger every month. When creating your ad, simply choose Messenger as the desired placement (you also need to select Facebook feed). 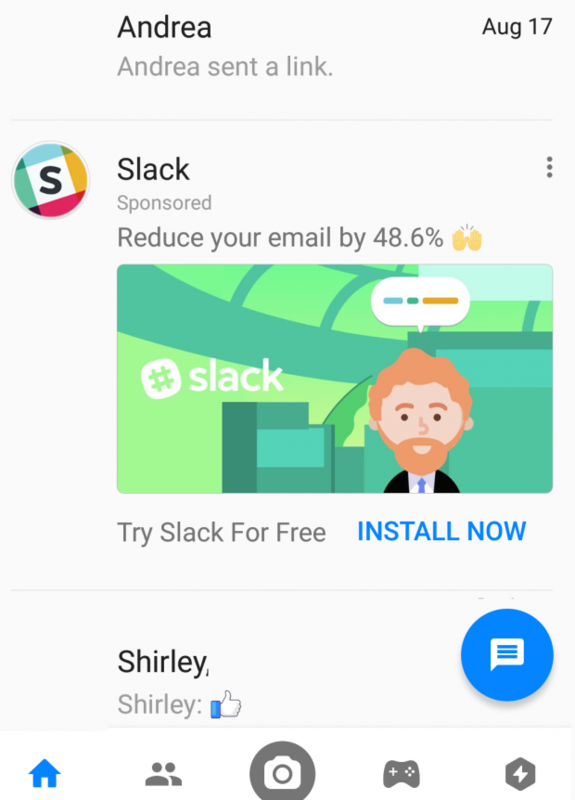 You can also run “click-to-Messenger” ads in the Facebook feed. These ads feature a call-to-action button that opens a Messenger conversation with your Facebook Page, so people can have a one-on-one conversation with one of your salespeople or customer service reps. If you already have a Facebook business page (and you should), you can head straight to the Facebook Ads Manager or Business Manager to create your Facebook ad campaign. If you don’t yet have a business page, you’ll need to create one first. We’ll follow the steps for Ads Manager in this post. If you’d prefer to use Business Manager, you can get the details in our post on how to use Facebook Business Manager. 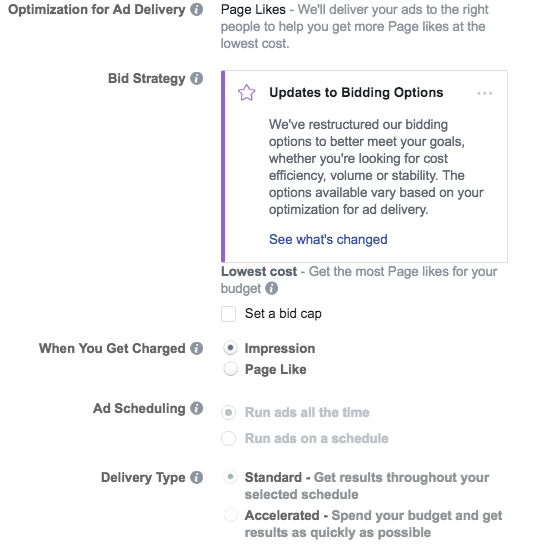 Log into Facebook Ads Manager and select the Campaigns tab, then click Create to get started with a new Facebook ad campaign. Reach: Expose your ad to as many people in your audience as possible. Traffic: Drive traffic to a specific web page or app. Engagement: Reach a wide audience to increase the number of post or Page Likes, increase attendance at your event, or encourage people to claim a special offer. App installs: Get people to install your app. Video views: Get more people to watch your videos. Messages: Encourage people to contact your business using Facebook Messenger. Conversions: Get people to take a specific action on your website (like subscribe to your list or buy your product). Catalog sales: Connect your Facebook ads to your product catalog to show people ads for the products they are most likely to want to buy. Store visits: Drive nearby customers to bricks-and-mortar stores. Choose a campaign objective based on your goals for this particular ad. Keep in mind that for conversion-oriented objectives (like sales) you can pay per action, but for exposure objectives (like traffic and views) you will pay for impressions. For this example, we’ll choose the Engagements objective. Some of the options you see in the next steps will vary slightly based on which objective you choose. 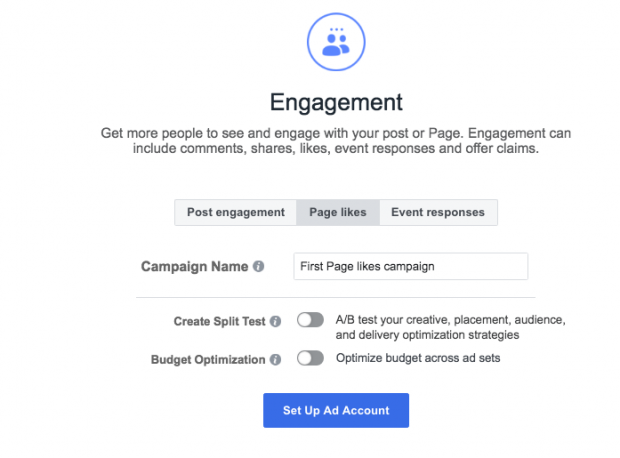 Scroll down to name your Facebook ad campaign and choose whether to set up an A/B split test. You will also choose whether to turn on budget optimization. This option can be useful if you’re using multiple ad sets, but for now you can leave it turned off. For the Engagements objective, you’ll also choose whether to focus on post engagement, page likes, or event responses. For this example, we’ll choose Page likes. Click Set Up Ad Account to continue. If you’ve already set up an account, you won’t see this step, of course. You’ll go straight through to targeting your audience. But if you’re new to Facebook advertising, you’ll need to enter some key account details here. Enter your country, preferred currency, and time zone, then click Continue. Choose wisely, because if you want to change these options later, you’ll have to create a separate ad account. At the top of this screen, you will name your Facebook ad campaign and choose which Page to promote. Scroll down to start building the target audience for your ads. You’ll see the first option is to add a custom audience of people who have already interacted with your business on or off Facebook. 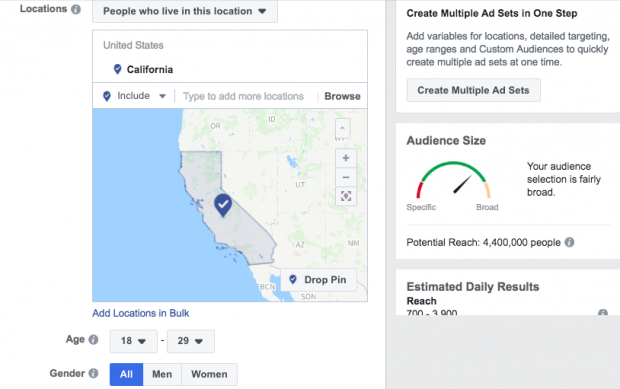 We’ve got a separate guide to walk you through Facebook custom audiences, so here we’ll focus on the targeting options. Start by selecting your target location, age, gender, and language. As you make your selections, keep an eye on the audience size indicator on the right of the screen, which gives you a sense of your potential ad reach. Detailed targeting: Use this field to specifically include or exclude people based on demographics, interests, and behaviors. You can get really specific here. For instance, you could choose to target people who are interested in both meditation and yoga, but exclude people who are interested in hot yoga. Connections: You can target or exclude people who have an existing connection to your Facebook Page, your app, or an event you managed. For example, if you want to reach a new audience, your would select “Exclude people who like your Page.” If you want to promote an offer or new product to existing fans, select “People who like your Facebook Page” to reach people who already know your brand. Scroll down to choose where your ads will appear. 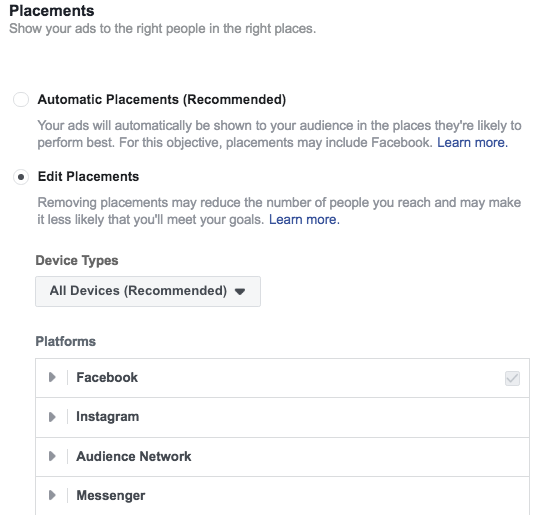 If you’re new to Facebook advertising, the simplest choice is to use automatic placements. When you select this option, Facebook will automatically place your ads across Facebook, Instagram, Messenger, and the Audience Network when they are likely to get the best results. Device type: Mobile, desktop, or both. Platform: Facebook, Instagram, Audience Network, or Messenger, with several sub-options within each category (like feed versus right column versus Stories). Mobile devices and operating systems: iOS, Android, or both. Next, you decide how much money you want to spend on your Facebook paid ads. 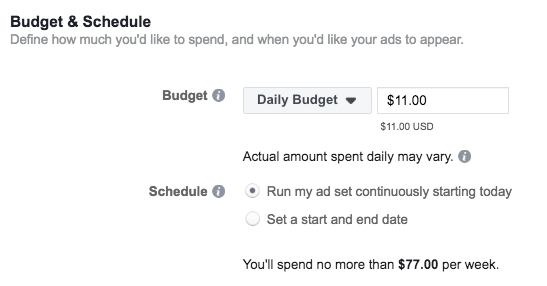 You can choose a daily or lifetime budget, then set the start and end dates if you want to schedule your ad in the future, or choose to make it live right away. You can get into pretty fine detail about how you want to spend your money using the advanced budget options. Keep in mind that running your paid advertising on a schedule may be the most efficient way to spend your ad budget, since you can choose only to serve your ad when your target audience is most likely to be on Facebook. You can only set a schedule if you have created a lifetime budget for your ad. 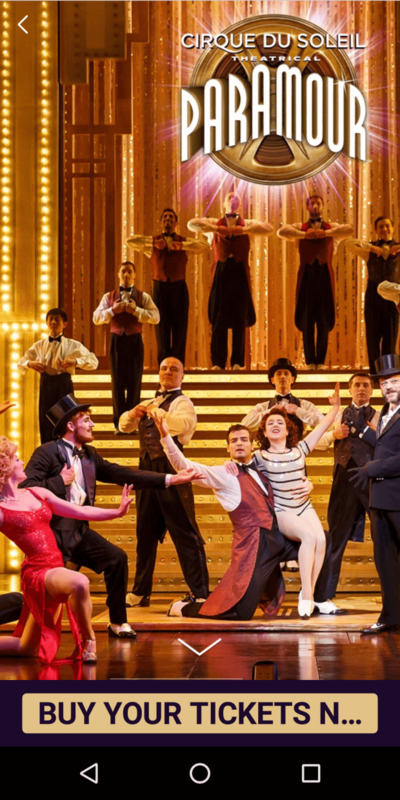 When you’ve made your selections, and you’re happy with the audience size indicator, click Continue. First choose your ad format, then enter the text and media components for your ad. The formats available will vary based on the campaign objective you selected back at the beginning of this process. Use the preview tool at the bottom of the page to make sure your ad looks good for all potential placements (mobile, desktop news feed, right column, and so on). When you’re happy with your choices, click the green Confirm button to submit your order, then wait to get an email from Facebook notifying you that your ad has been approved. There are a lot of details to keep in mind when getting your images and videos ready for Facebook ads. Since these details can change often, we’ve compiled them in a separate post of Facebook ad specs for images and videos. To plan effective ads, you need to keep the allowed character counts in mind. Anything beyond these text limits will be cut off. 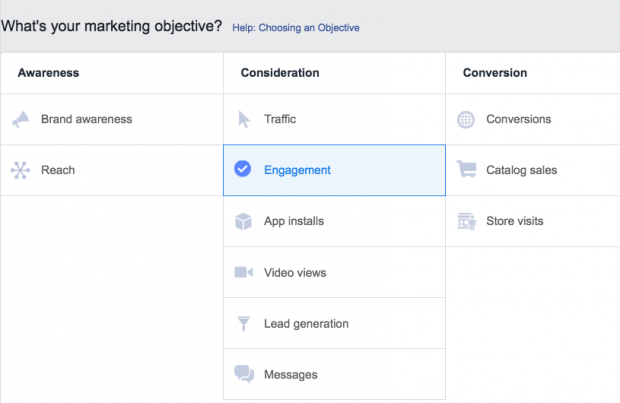 You also need to understand which types of Facebook ads work with each of the ad campaign objectives described above. Keep these important strategies in mind to make the most of your Facebook advertising efforts. Start with a narrow audience and then broaden it slowly by adding one interest category at a time. For example, you could start with an audience specifically interested in “Napa Valley wine tours” and then broaden it after a few weeks, adding “wine tasting,” “food and wine,” and so on. That way, you’ll have a good idea of how expanding your target audience affects your results. We go into this concept in detail in our post on how to use Facebook Audience Insights. You can also use audience targeting to create different ads for groups related to different business goals. For example, you can speak to existing customers differently than you do to people who have never heard of your business before, or offer promotions based on your existing relationship. Pro tip: Be careful with the assumptions you make about your audience when choosing your targeting options. Since moving to Europe, I get a lot of Facebook ads that make perfect sense based on where I live. One problem: They’re in Dutch, which I don’t speak (yet). Advertisers are paying to show me ads I don’t understand, which they could easily avoid with language targeting. The Facebook pixel is a small piece of code that can have a big impact on your Facebook ad campaign. Once you place the code on your website, it will allow you to track conversions, remarket to people who have viewed a product on your website, and create lookalike audiences. Even if you’re not ready yet to engage in some of the more advanced strategies you can implement with the Facebook Pixel, you should install it now. That way you’ll have tracking and remarketing data ready to go when you are ready to start optimizing your Facebook ads. Use our step-by-step guide to using the Facebook Pixel to get it set up on your website now. You know what’s a turnoff? Blurry photos. Or pixelated photos. Or jumpy videos that make you feel sick. Your words are important, sure, but your visuals are what will first grab viewers’ attention and create the best impression. These free stock photo websites can help you source high-quality images to use in your ads. If you sell a product, Facebook recommends that you try using photos showing people using and benefitting from your product, rather than an image of the product all by its lonesome. It’s important not to make assumptions about what will work and what won’t in your Facebook ads. Every time you try something new, you should test it against your previous Facebook ads so you can see whether you’re making improvements to the metrics that matter most to you. After all, the wisdom about best practices for Facebook ads is constantly changing, but only you know what works for your specific audience. And the only way you can keep that knowledge up to date is by testing. Since this is such an important topic, we’ve got a whole guide on how to use social media for A/B testing. Closely monitor how your campaigns are performing in the Facebook Ads Manager dashboard. If a campaign isn’t performing, take budget out and put it into an ad that is. If you’re just starting out, it might make sense to run several ads with small audiences and budgets. Once you’ve determined what works best, use the winning ad as your primary campaign. There are also tools that will simplify—and even automate—this process. For solo marketers, agencies, and small to medium-size businesses, AdEspresso makes creating, managing, and optimizing ads quick and uncomplicated. If you work for a larger organization, we of course recommend Hootsuite Ads. From the same dashboard that you monitor all your other social channels, you can create and test hundreds of Facebook ads in minutes. And with easy-to-understand analytics, you can uncover your best ads at a glance. You can also re-allocate money from your under-performing ads to top-performers (even if they’re on another platform). Automatically boost budgets or start new campaigns based on pre-set performance triggers. And then improve performance further with automatic, daily recommendations. See what Hootsuite Ads can do for your business by requesting a demo. Ready to go but not sure what you should promote with your Facebook ads? We’ve put together three campaign strategies to get you started. Every brand has a few killer pieces of content that drive most of the traffic each month. Adapting that content into a short video can be a great way to repackage top content for the best Facebook ads. To create your video, think about ways to convey your content’s key messages through short text and images. Then, use one of these social video tools to create your video, or create a slideshow video ad in Facebook Ads Manager. Pro tip: Check out our video strategy kit for marketers, which has lots of great insights about what types of video work best on social media. If you have a recognized brand and a good product, especially one with a relatively low price point, there’s no reason Facebook can’t generate direct sales. When the Miami Heat launched a series of special edition merchandise, they used Facebook ads to target people who had previously bought team merchandise or tickets online, or who had placed an item in their shopping cart in the last month. They also targeted new customers using lookalike audiences to reach people likely to be interested in the team. The campaign reached nearly a million people, and the special edition jerseys sold out in just an hour. Pro tip: One of the most effective ways to drive sales directly from a Facebook ad is to target people who have already considered buying your product—as the Miami Heat did in this example. Your Facebook ads could include targeted offers, product recommendations, or reminders to complete their purchase. We cover this concept—known as remarketing—in our blog post on how to optimize Facebook ads. You don’t have to limit your Facebook advertising strategy to online sales. With the store visits objective, you can promote offline purchases, too. You can also use the engagements objective to drive people to an offline event, and use the lead generation objective to get them to your store or dealership to experience your product in person—for example, through a test drive. Carrefour Italy used Facebook paid ads with the store visits objective to encourage people to visit its supermarket locations. Nearly nine percent of the people who saw the ads actually went to Carrefour stores—that’s nearly 285,000 shoppers. In the past Carrefour would have used newspaper ads and flyers for the same advertising goal, but they found the Facebook ad campaign to cost 80 percent less. Pro tip: Facebook allows you to track offline conversions so you can understand the effectiveness of ads that drive sales offline. You can also use this tracking information to build custom audiences of people who interact with your brand offline, so you can target them even more effectively with future ads. Get the most out of your Facebook ad budget with AdEspresso by Hootsuite. The powerful tool makes it easy to create, manage, and optimize Facebook ad campaigns. Try it free today! This is an updated version of a post originally published in May 2015. With files from James Mulvey.